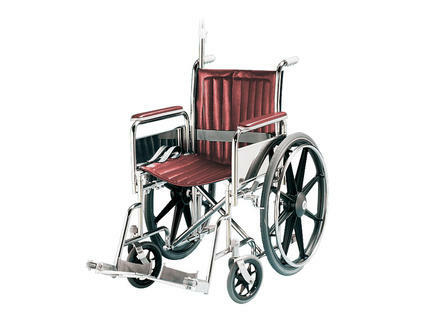 The non-ferrous wheelchair is available in three widths and patient load capacities to accommodate almost any size patient. Fixed, flip-up footrests with heel loops and roller bumpers provide maximum patient comfort and protection. Easy maneuverability is achieved with two 24" (61 cm) rear wheels with plastic wheel bearings. Precision mounted 8" (20 cm) front casters always roll true and are virtually unbreakable. The chair locks securely for stable positioning and the full-length armrests are removable for safe patient transfer. The unique appearance of the MRI wheelchair helps to eliminate confusion with standard wheelchairs in the MR suite. The burgundy upholstery is easy to maintain and is sealed to protect against spills. Quick release safety belt and stainless steel IV pole are standard. *Note: Does not fit through standard-size doorway.